As Mr. Hedges noted, something is seriously wrong with our species. I’m going out on a limb and suggesting what’s wrong is that insanity passes for normal because inmates are running the asylum. The symptoms of mass insanity are everywhere and obvious, though seldom to the insane. Read the headlines, turn on a radio or TV, log onto news sites and check out the mind-numbing reports about greed, corruption, conflicts, bombings, killings, atrocities, human trafficking, global warming, the slaughter of endangered species, ocean dead zones, growing drug, obesity, and STD epidemics, and on and on ad nauseam. Moreover, the most telling symptom of all is an incomprehensible ability to ignore, rationalize, and/or deny the existence of rampant madness. Sane humans don’t lie, cheat, destroy, pollute, wage wars, enslave, threaten their species’ survival, turn a blind eye to insanity, or attribute inhumanity to human nature. 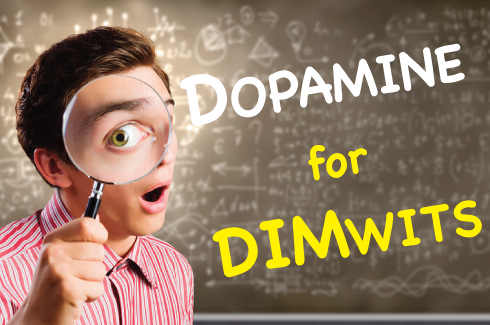 Acknowledging the insanity poses a major threat to dopamine flow because it threatens safety, esteem, acceptance, and peer approval (especially for individuals who point out the insanity). Ignorance might not be bliss, but it does protect dopamine flow. The symptoms of all addictions include illogical, destructive, and insane behaviors, self-deception, denial, an intransigent commitment to continue indulging addictive behaviors, indifference to the resulting damage, flagrant dishonesty, and a proclivity to ignore, dismiss, attack, stifle, silence, and eliminate threats to the dishonesty. The mental disorder plaguing our species was passed down from primitive ancestors who weren’t smart enough to understand they were suffering from a mental disorder. Succeeding generations proved more clever than sapient and much better at duplicity than honesty. As a result, we’re all born and indoctrinated into societies where deception and insanity are norms. Dangerous, destructive, and depraved addicts crave the dopamine triggered by expectations of power, esteem, and financial payoffs granted political, criminal, corporate, religious, and other institutional bigwigs. Additionally, certain pathological symptoms of addictions, such as lying, deceit, cheating, stealing, and killing, provide significant benefits to power, status, and money addicts. In the race for control of our species, sane contenders never stood a chance against insane addicts. Sanity, honesty, reason, and humanity have always been liabilities whereas insanity, dishonestly, ruthlessness, and inhumanity were, and are, invincible assets. I’m not suggesting a conscious conspiracy. Consciousness and addictions don’t mix. Which is why history is indeed little more than the register of unconscious brutes spreading defective genetic programming far and wide while removing conscious opponents’ DNA from the gene pool and never the other way around. Inside the asylum, dishonesty reigns and the need to maintain dopamine flow precludes concerns about our species’ fate. The addicts controlling the asylum are driven to continue the age-old, self-serving, flimsy charade that dopamine-induced addictions are normal, logical, and even admirable behaviors. The hypocrites waging failed drug wars don’t want to hear they’re destroying lives to score the same dopamine squirts junkies trigger with heroin. And inmates will never accept that the problems they complain about can be explained in terms of addictions that reduce all choices down to protecting and triggering dopamine flow because the greatest threat to dopamine flow is admitting to addictions. Thinking outside the asylum makes it possible to cut through obvious deceptions and zero in on the root cause of the widespread insanity, denial, and convenient ignorance that keeps us from seeing what’s right before our eyes — dopamine-induced madness and addictions to safety, power, acceptance, approval, attention, esteem, status, belief systems, and money.